Since posting about the incident with the Torm Mary last week, I was inspired to capture some photos of a ship as it traveled up the Piscataqua River in Portsmouth, NH. Having kayaked in the river myself very briefly, I can personally attest to the fast currents and lively waters that this tidal river is so famous for. During each tide cycle, the entire volume of Great Bay as well as the flow from 5 large rivers pushes through the Piscataqua on its way to the Atlantic Ocean. 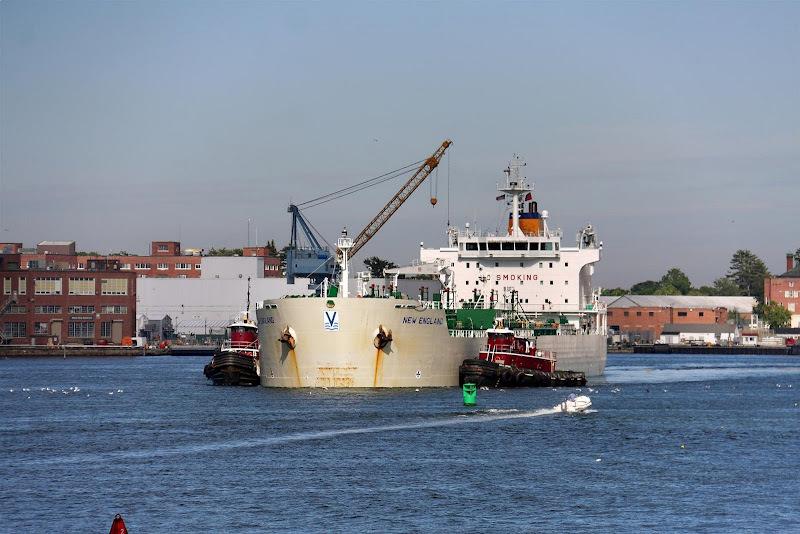 First, a view into how cargo was moved on the Piscataqua River in centuries past. 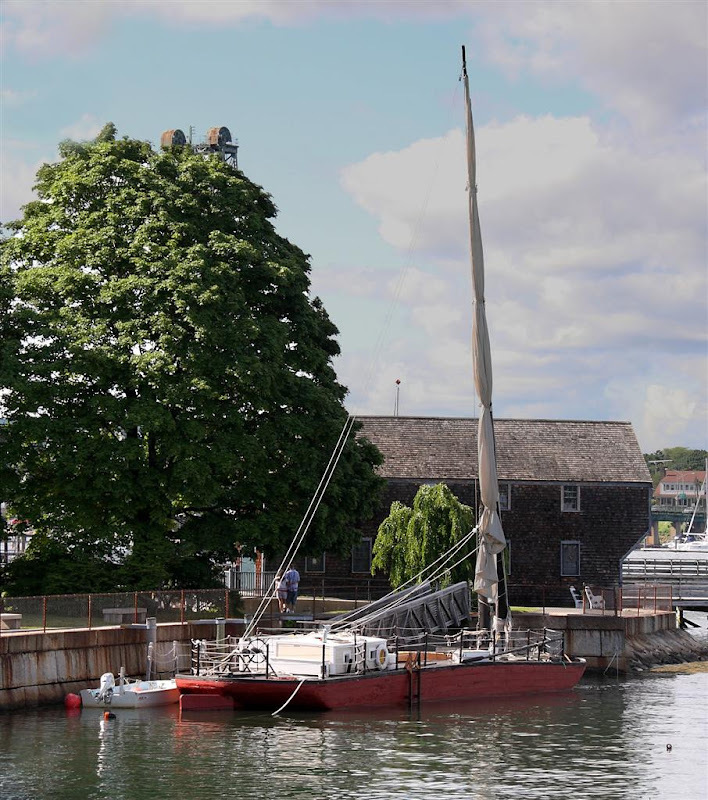 The Gundalow shown below is a replica of a design that dates back to the 1600s in Portsmouth. These shallow draft vessels were essential in moving supplies and goods to and from early settlements along the rivers in Exeter, Newmarket, Durham, Dover, and Berwick, ME. Since the early settlement of the area, the dangers of navigating the Piscataqua have been legendary. In the 18th and 19th century, seafarers commented on the cross-grained and wily waters of the Piscataqua and even named a famously tough turn in the river "Pull-and-Be-Damned-Point." They were actually referring to Henderson's point, in Kittery, which is just across from Newcastle. In July of 1905, Henderson's point was the site of the largest explosion the world had ever seen, as workers attempted to rid the river of the treacherous rock outcropping at the behest of the US Navy. 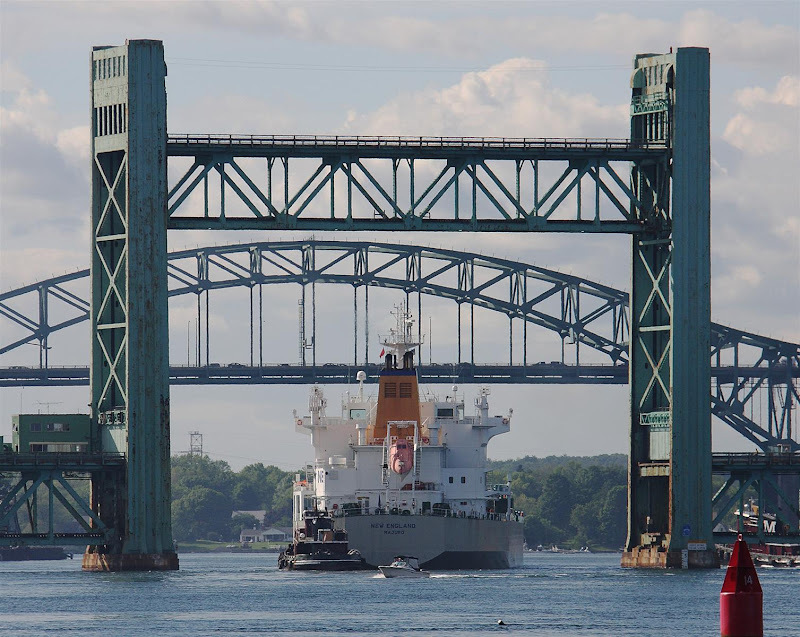 Large ships can only navigate the Piscataqua during slack tide when the water is at its highest. I checked out the Moran Tug dock on Ceres Street to see if any of the three tugs were out. With two of the three tugs missing, it was looking good for a large vessel to be on its way in. The map below shows the path of the vessel in the photos that follow. You can click on the blue labels to see their names. The vessel "New England" approaches the Memorial Bridge. You can see the Portsmouth Naval Shipyard behind it. The vessel has just cleared the tough turn at Henderson's Point. Next, the ship threads the needle through the Memorial Bridge. 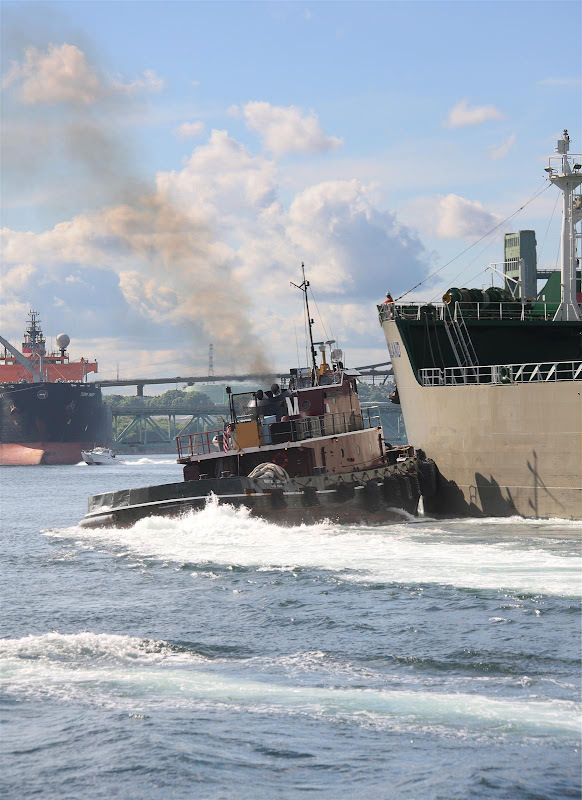 Smoke pours from the stack of a tug as it struggles to push the vessel through the turn near Badger's Island. You can see the Torm Mary, still docked at the state pier on the left. That tug is still working hard to make sure the vessel gets around the bend ok.
One more needle to thread at the Sarah Long Bridge. Once the ship makes it through the Sarah Long Bridge, it's just a few hundred more yards to the Irving Terminal.